(a) Absolute Co-ordinate System. In the absolute system the co-ordinates of a point are always referred with reference to the same datum. The datum positions in the X-axis, Y-axis and Z-axis are defined by the user / programmer before starting the operation on the machine. A major advantage of using absolute system is that it is very easy to check and correct a program written using this method. If a mistake is made in the value of any dimension in a particular block, it will affect that dimension only and once the error is corrected there will be no further problems. (b) Incremental Co-ordinate System. 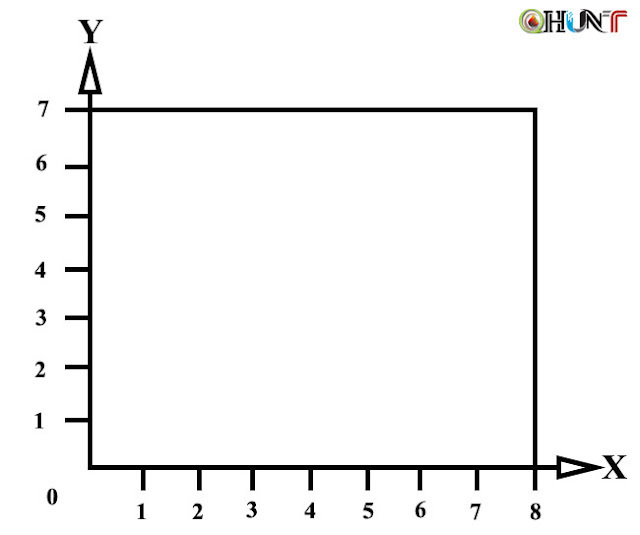 In the incremental system the co-ordinates of any point are calculated with reference to the previous point i.e. the point at which the cutting tool is positioned is taken as datum point for calculating the coordinates of the next point to which movement is to be made. It is difficult to check a part program written in incremental dimension mode. The coordinates of a point can be given either in inch system or in metric system. In addition, the position of a point may be defined using the polar co- ordinates where the distance of the point from a specified datum point and the angle from a specified datum axis give the coordinates of the points. Most of the CNC/NC machines are capable to work in the absolute as well as incremental coordinate systems. While adopting a single system of co-ordinates will serve to simplify the programming, the two systems may many times be mixed to save time and avoid duplication of effort in making the program. It is always convenient to write the main program in absolute system and subroutines are written in incremental mode. However, the programmer has to tell the control system whether absolute or incremental mode and whether system or metric system inch will be used. This is achieved by giving relevant codes in the program.